So, my mom bought a new car – a very practical one; a 2008 Toyota Vios, G model. “G” is Toyota’s way of saying the car is in the top of it’s class – all the amenities, mag wheels, higher displacement engine, the works. Only thing we didn’t get is the insane 40+ thousand upgrade for leather seats. 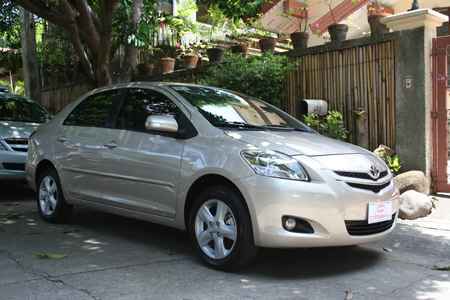 Ours is an automatic with a 1.5L engine, so basically, it’s the 2nd most expensive Vios (Php 765,000.00) around. In this review, I will not bore you with numbers and 0-100 km/h statistics. I took pictures of the car from all angles, and added captions and commentaries for each picture. I took into account the average small and young family looking for a daily driver for “pops” and a weekend ride for mom, pops, and the yet-to-go-to-school bulinggits. In my opinion, the Toyota Vios does not serve any purpose better than this. Of course, there are choices. Basically, the Vios is a level lower than compact cars. Compact means Honda Civic, Toyota Altis, Nissan Sentra. Of course, in the Philippines, smaller is better – easier to maneuver through traffic and parking spaces, and better gas consumption – which reminds me to include here the 15 km/l it gets on average. 15 km/l – that’s nearly twice what we used to get from the 90’s Civics, Corollas, etc., and a Php 50 costing trip from Alabang-Nichols. Technology is getting better in producing more kilometers per liter, but gas prices are getting higher. Ergo, everything stays the same. Back to the choices. The only other sub-compact in my list is the Honda City. Of course there is the Honda Jazz, but it became more of a “porma” car than a family car. The Honda City has a 1.3 engine. In Toyota’s defense, a 1.3 liter engine consumes more gas because it’s hirap. I say, Honda has VTEC and other advanced engine technologies so basically they consume the same amount of gas and produce nearly equivalent power outputs. Brands-wise they’re both Japanese. But to put it in a more apt perspective, a Toyota will surpass at least twice it’s life expectancy and a Honda, is well, a Honda. This is slowly becoming the most boring Toyota Vios review ever, so let’s proceed to the more exciting life in color. Click on the picture below to view the review and do share your knowledge and opinions about sub-compacts for comparison. nice…I have the same car, but in the US market, it is called the Yaris. “Subcompact” is the category, and the main competitors are the Honda Fit and the Nissan Versa. We have no City available here, and I’m not sure if there is an equivalent for the Versa in RP. We only have the 1.5 available here. Hi. We have the Honda Fit. It’s called Jazz here. City is the sedan version of the Jazz. No Nissan Versa here. If it was me, I’d add a little more, and get the cheapest Honda Civic. But that’s just me. I got a zen remote for my Vision, and my GF’s Vision W.
same here, I’d get the cheapest Civic or Corolla. Rastaman: thanks for the tip dude. hector esguerra: not sure about the 1.3 (ours is a 1.5), but we get around 10.5-11 kms/l on average. 12-14 on highway and 9.5-11 city. what do you get? they really do exagerate the consumption on ads. It is recommendable to get a 1.5 rather than a 1.3 because it has the same body size and weight. You tend to over-rev on a 1.3 as compared to a 1.5 resulting to more fuel consumption. can a j type 1.3 vios go up a steep hill? a 60 degree hill? yes a 1.3j vios can step up hill 60 deg, and its depends on how you change gear in split second not to lossen the power. i experienced it personally. Ive been using a 1.3e 205 Toyota vios. Ive tested the car that it can go 13 to 14km/liter in metro manila. ive been driving 6o to 80 kph. Imagine the heavy traffic and still it can go that far. The technology of vvt-i or variable valve timing with intelligence is amazing. If you want economy, you can get it. If you want to go fast, the engine can instataneously go fast. That’s why they call it WITH INTELLIGENCE. Their are may ways to increase your kilometer per liter like using “energy conserving oil” , liqui moly, correct tire pressure, drive slowly, accelerate slowly etc. I asked about the Vios 1.3J which has no ABS. Is that OK? Isn’t it scary to drive one like that? it’s the one I can afford but I am apprehensive when I read it has no ABS and TVSS. These are safety features that aren’t present in the J model. Would it make a difference? Any comment would be appreciated. it’s okay not to have ABS or TVSS. these are just additional features for additional security. bsta maingat ka lang mag.drive, hndi ka na magproproblema pa na walang ABS sasakyan mo. as for TVSS, security alarm lang yan in other words. don’t leave valuables inside the car is what i suggest. Thank you so much tricky for your helpful suggestions! I didn’t understand much what’s TVSS though I had a bit of an idea, but now I know from you, I won’t have to worry if the j has no TVSS coz I am not residing in Manila and carnapping and auto theft is not common here yet. I guess you’re right that it depends on how you drive, no matter how nice your car is pag hindi ka maalaga or you drive recklessly, wala rin. thank you again tricky!! !